Anping is a place where visitors can see historical buildings and old streets, sample local snacks, and take boat tours on canals. 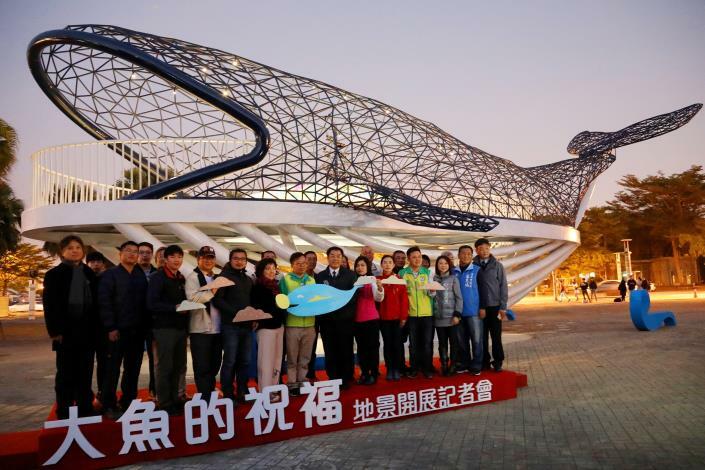 Now Anping offers a new tourist destination: “Greetings from the Whale” is a brand new public art piece created by well-known Taiwanese artist Yang Shih-yi (A-Guei) and commissioned by Tainan City Government Tourism Bureau. 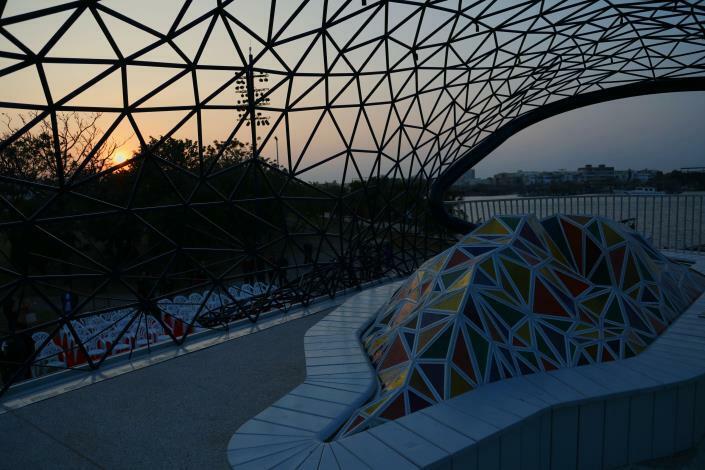 The artwork was unveiled in the Historic Harborside Park next to Anping Harbor on January 21 evening. 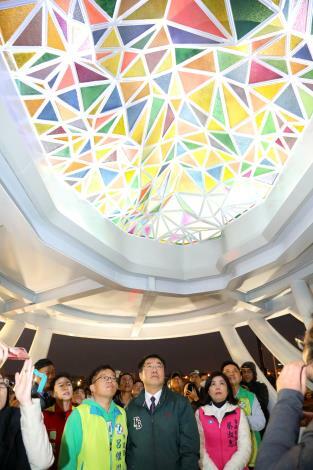 Tainan Mayor Huang Wei-che, artist Yang Shih-yi, and many guests attended the official lighting of the artwork. Mayor Huang expressed that this piece of art is not only a presentation of excellent craftsmanship and technology, but also a manifestation of humanity and emotions that can warm our hearts on the coldest days. Huang was deeply moved by the story, imagery, and meaning behind the piece. He also pointed out that the entire artwork was built without a single pillar or rivet, and every piece of colored glass is cut in a different shape and angle, showing the artist's extraordinary skills and capability to create such a challenging piece. The Mayor further remarked that the newly revealed artwork will become a local landmark and attract more visitors. During the daytime, people can come and watch the sunrise, sunset, and ocean view; and after dark, visitors can enjoy the diverse showcase of light and shadows. The city government will plan and launch suitable tourism plans for the area, and Huang also mentioned that he is eager to see Anping's new greenery scene after the urban revitalization projects are completed. Yang Shih-yi is a photographer, director, and papercutting artist. This art piece is actually the main protagonist of his original story, “Greetings from the Whale”. 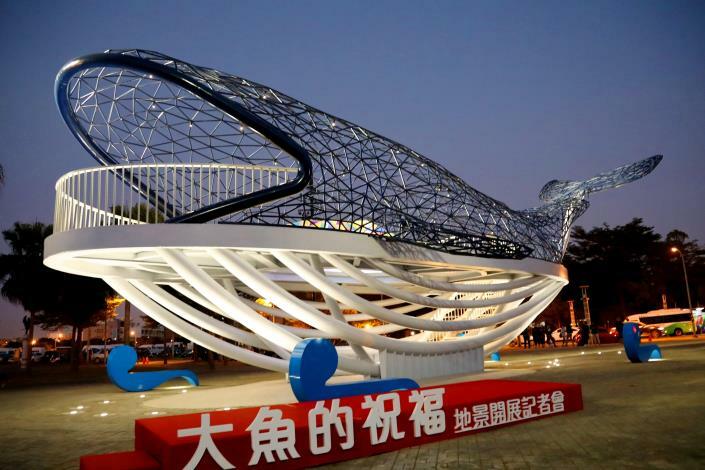 The large whale art installation is 23 meters long, 10 meters wide, and 8 meters tall. At the display area, Yang explained his inspiration, and creation story and process of the large whale to the audience. The upper part of the whale is made up of 3,714 stainless steel pipes. No screws were used in the entire structure. 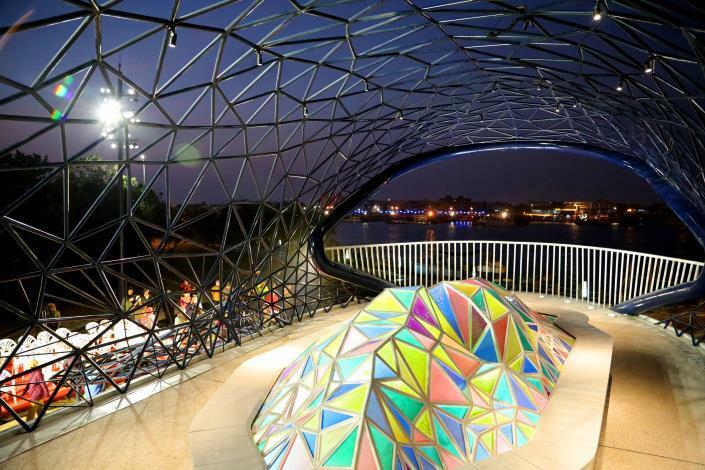 The Taiwan-shaped installation inside the whale, which represents our inclusive and diverse island, is made up of 634 stainless steel pipes and set with 448 pieces of colorful glaze-fired glass. The entire artwork weighs over 20 tons, and is supported entirely by the curves and lines of the belly of the whale, creating a pillar-less support structure. Yang guided the Mayor and guests into the whale and introduced three viewing angles to appreciate and connect with his work. The first one is to stand on ground level and look up to the underside of the glass Taiwan, which is composed of 448 pieces of colored glass. This is a way for viewers to express their regards and respect to the island. The second angle is to look down to the glass island from the second floor, a gesture that expresses gratitude to the island. The third angle would be to look around at the people around you, acknowledge that we are all living on this same island and should treat each other with kindness, just as Taiwan treats us kindly. Tainan City Government Tourism Bureau also collaborated with a number of art teams to create “Greetings from the Whale” souvenir t-shirts and other cultural and creative products for this public art exhibition. At the moment the initial design samples are already in print, and soon the products will be available at various tourist spots, including Anping Old Fort, Anping Tree House, Eternal Golden Castle, Chihkan Tower, Koxinga Shrine, and Patriotic Women's Association.